Received: December 26, 2016; Revised: June 8, 2017; Accepted: June 10, 2017; Published online: July 1, 2017. Irritable bowel syndrome (IBS) patients commonly experience psychiatric disorders, such as depression and anxiety. This meta-analysis sought to compare depression and anxiety levels between IBS patients and healthy controls. We searched major electronic databases (PubMed, EMBASE, MEDLINE, and Cochrane library) to find comparative studies on IBS patients and healthy controls. The primary outcome was a standardized mean difference (SMD) of anxiety and depression levels; sub-group analyses were conducted according to IBS-subtypes. In total, 2293 IBS patients and 4951 healthy controls from 27 studies were included. In random effect analysis, depression and anxiety levels were significantly higher in IBS patients (pooled SMD = 0.76; 95% CI, 0.62–0.90; P < 0.001; I2 = 77.2% and pooled SMD = 0.84; 95% CI, 0.67–1.01; P < 0.001; I2 = 85.6%, respectively). Both analyses’ funnel plots showed symmetry. In meta-regression analysis, heterogeneity was due to the studied region and questionnaire type for both depression and anxiety. In sub-group analyses of IBS-subtype, the pooled SMDs of depression and anxiety levels (IBS with predominant constipation: 0.83 and 0.81, IBS with predominant diarrhea: 0.73 and 0.65, and IBS with mixed bowel habits: 0.62 and 0.75; P < 0.001, respectively) were significantly higher in all IBS-subtypes. The present meta-analysis showed depression and anxiety levels to be higher in IBS patients than in healthy controls, regardless of IBS-subtype. However, the gender effect on psychological factors among IBS patients could not be determined and should be evaluated in prospective studies. Several recently published studies have mapped IBS’s relationship with psychological disorders10–16 and compared depression and anxiety levels in IBS-subtypes.15,17,18 However, the relationship between IBS and psychological disorders (depression or anxiety) was inconsistent, even in a recent meta-analysis entailing eight studies.19 The heterogeneity of the results was too high, with no further analysis of its cause. Furthermore, IBS-subtypes failed to show statistical significance for both anxiety and depression, except IBS with predominant constipation (IBS-C) and IBS with predominant diarrhea (IBS-D) for anxiety, and IBS-D for depression, because few studies were included. Knowledge of IBS’s correlation with psychiatric disorders would enhance understanding and treatment of IBS patients, as psychological distress could exacerbate symptoms, negatively affect treatment outcomes, and affect doctor-patient relationships.4 The aim of this meta-analysis was to compare depression and anxiety levels between IBS patients and healthy controls, also considering IBS subtypes and patient gender. The protocol for this review was prospectively developed, detailing specific patients, healthy controls, the primary outcome, study selection criteria, and study quality checks. The checklist and flow chart of the Preferred Reporting Items for Systematic Review and Meta-Analyses (PRISMA) statement were referred to, to achieve the highest standard in reporting items for a systematic review and meta-analysis. The following inclusion criteria were applied: (1) articles published from January 2000 to July 2016 in peer-reviewed journals, (2) comparative studies on IBS patients and healthy controls, (3) adults ≥ 18 years, and (4) depression and anxiety levels presented or extracted as mean ± SD. Our search terms were “((irritable bowel syndrome) OR irritable bowel syndrome[MeSH Terms]) AND (((depression) OR depression[MeSH Terms]) OR depressive disorders[MeSH Terms])) AND (((anxiety) OR anxiety disorders[MeSH Terms]) OR anxiety[MeSH Terms]))) AND “2000/01/01”[Date - Publication] : “2016/07/31”[Date - Publication]” for PubMed; “‘irritable bowel syndrome’ AND (‘depressive disorder’ OR ‘depression’) AND (‘anxiety disorder’ OR ‘anxiety’) AND ‘article’/it AND [1-1-2000]/sd NOT [31-7-2016]/sd AND [embase]/lim” for Embase; “‘irritable bowel syndrome’ AND (‘depressive disorder’ OR ‘depression’) AND (‘anxiety disorder’ OR ‘anxiety’) AND [2000–2016]/py NOT [31-7-2016]/sd AND ‘article’/it AND [medline]/lim” for Medline; ““irritable bowel syndrome” in Title, Abstract, Keywords and “anxiety disorder” OR “anxiety” in Title, Abstract, Keywords and “depression” OR “depressive disorder” in Title, Abstract, Keywords” in Cochrane Reviews for Cochrane library. The results from the database search were imported into EndNote X7 software (Thomson Reuters, Philadelphia, PA, USA) and combined to remove duplicates. Two authors (C.L. and E.D.) independently assessed the titles and abstracts of all the studies identified through the search outlined above. Full texts of studies fulfilling the inclusion criteria were obtained and reviewed. Exclusion criteria were (1) studies did not present depression or anxiety scores, (2) studies that could not determine the mean and SD, (3) studies with no healthy controls, (4) studies with only one IBS-subtype or only post-infectious IBS, (5) studies with low quality scores, and (6) duplicated study data. Disagreements were resolved through discussion; otherwise the co-author, Y.S.K., was consulted. Two independent authors (C.L. and E.D.) assessed article quality according to the Newcastle-Ottawa Scale for “case-control studies.”20 The quality scale ranges from 0 to 9 points, with ≤ 4 indicating poor article quality, and warranting its exclusion. Two authors (C.L. and E.D.) independently analyzed articles and extracted data using a pre-defined data extraction worksheet. The following information was extracted from each article: title, first author, publication year, country of origin, IBS criteria, type of questionnaire for depression, type of questionnaire for anxiety, the number of IBS patients, the number of healthy controls, the proportion of females in the IBS group, the mean and SD of depression levels, and the mean and SD of anxiety levels. To determine depression and anxiety levels in IBS-subtypes, the following information was also extracted: the number of IBS-subtype patients and means and SDs of depression and anxiety levels among these. In this meta-analysis, the standardized mean difference (SMD) was used for comparing IBS patients’ and healthy controls’ anxiety and depression levels because various types of questionnaires were used to assess these variables. We estimated SD from the standard error (SE) of the mean, using the formula SD=SE×N, and calculated SD from a 95% confidence interval (CI) using the formula SD=N×(Upper limits-Lower limits)÷3.92. Meta-analysis was conducted using STATA ver. 14.1 (Stata Corp, College Station, TX, USA). We used the STATA “metan” command for calculating SMD with 95% confidence intervals. If the studies showed substantial heterogeneity (I2 > 50%), we used random effects models. We also used the STATA “metan” command to create the forest plot. Publication bias was assessed through the Egger’s test, using the “metabias” command, and presented graphically with funnel plots, using the “metafunnel” command. The cause of heterogeneity was analyzed using the “metareg” command. Through a database search, 1737 records were identified (PubMed, n = 637; Embase, n = 579; Medline library, n = 517; Cochrane library, n = 1; other sources,21–23 n = 3) and 837 records remained after duplicates were removed. Initial screening of the title and abstracts resulted in 786 records being excluded. Full texts of the remaining 51 records were reviewed in detail. A total of 27 articles were included in this systemic review and meta-analysis,10–13,15–17,21–40 and 24 articles were excluded with specific reasons; (1) 8 studies without depression or anxiety scores,41–48 (2) 3 studies from which the mean and SD could not be determined,49–51 (3) 4 studies with no healthy controls,14,52–55 (4) 2 studies with only one IBS-subtype or post-infectious IBS,56,57 (5) 5 studies with low quality scores (Newcastle-Ottawa Scale ≤ 4),58–62 and (6) 2 studies with duplicated data.63,64 The selection process according to the PRISMA flow diagram is shown in Figure 1. Meta-regression analysis was conducted due to medium and high heterogeneity. The result of meta-regression is shown in Table 2. In the meta-regression analysis, the heterogeneity of pooled SMD in the level of depression was due to the studied region (East Asia, USA, Europe, and others; P = 0.007) and type of depression questionnaire used (HADS, BDI, SDS, and others; P < 0.001). The heterogeneity of pooled SMD in the level of anxiety was also due to the studied region (East Asia, USA, Europe, and others; P = 0.002) and type of anxiety questionnaire used (HADS, STAI, SAS, and others; P = 0.007). Pooled SMD according to subgroup analyses is also shown in Table 2. Wherein depression levels are assessed through a subgroup analysis, studies using the HADS (pooled SMD, 1.02; 95% CI, 0.83–1.21; I2 = 66.3%) and the BDI (pooled SMD, 0.71; 95% CI, 0.52–0.90; I2 = 0%) showed higher SMD than other questionnaires. Furthermore, studies conducted in East Asia showed the lowest pooled SMD (pooled SMD, 0.50; 95% CI, 0.32–0.69; I2 = 56.3%). Wherein anxiety levels were assessed through a subgroup analysis, studies using the STAI and the SAS showed low heterogeneity (I2 = 48.5% and I2 = 0.0%, respectively); those conducted in East Asia also showed the lowest pooled SMD (pooled SMD, 0.51; 95% CI, 0.29–0.73; I2 = 68.5%). Depression and anxiety levels in IBS-subtype patients were also analyzed. A total of six studies were included.15,17,18,37,38,65 In those studies, healthy-control groups were used for multiple comparisons with the three IBS-subtypes; we divided the healthy-control group into three groups for meta-analysis of three IBS-subtypes alongside healthy controls. Depression levels were significantly higher in IBS-C (SMD = 0.83; 95% CI, 0.61–1.06; I2 = 0%; P < 0.001), IBS-D (SMD = 0.73; 95% CI, 0.51–0.96; I2 = 0%; P < 0.001), and IBS with mixed bowel habits (SMD = 0.62; 95% CI, 0.39–0.84; I2 = 0%; P < 0.001) (Fig. 4A). Egger’s test (P = 0.323) showed no small-study effects and the funnel plot showed symmetry (Fig. 4B). Anxiety levels were also significantly higher in IBS-C (SMD = 0.81; 95% CI, 0.59–1.04; I2 = 0%; P < 0.001), IBS-D (SMD = 0.65; 95% CI, 0.43–0.87; I2 = 0%; P < 0.001), and IBS with mixed bowel habits (SMD = 0.75; 95% CI, 0.52–0.97; I2 = 0%; P < 0.001) (Fig. 5A). Egger’s test (P = 0.830) showed no small-study effects and the funnel plot showed symmetry (Fig. 5B). We found that depression and anxiety levels in IBS patients were significantly higher than in healthy controls, even in the subgroup analyses with IBS-subtypes. Our studies also showed significant heterogeneity of these findings (depression, I2 = 77.2%; anxiety, I2 = 85.6%), however, we found the study region and type of questionnaire used to assess depression or anxiety levels to be the main causes of heterogeneity, using meta-regression analysis. We studied the level of depression and anxiety, not prevalence, because of the continuing dispute on the threshold of questionnaires in patients with a medical illness. Patients with medical symptoms may record a high score that inappropriately suggests depression. Only the HADS has been reported to be suitable for measuring depression in patients with a known medical illness, because it was specially designed to overcome the said difficulty by omitting somatic symptoms.66 The other questionnaires might overestimate the symptoms of depression because they do not rule out somatic questions. However, the HADS is a symptom-screening questionnaire, and not a diagnostic measure for depression. Furthermore, pooled SMD of the HADS was higher than other questionnaires in meta-regression analysis of our study. There is still no consensus on this issue. The studied regions contributed to the significant heterogeneity found in this meta-analysis. The prevalence of IBS, anxiety, and depression varies according to the cultural region. This diversity in prevalence may be due to actual differences in prevalence, discrepancies in measurement, due to translation, and limited validation of questionnaires in question in each cultural region, or all of them.67 Cross-cultural factors are considered important, not only in the diagnosis of anxiety and depression, but also in IBS, as symptoms are also vague and there are no objective findings to confirm the diagnoses. Furthermore, the translation of words used to describe symptoms into another language introduces complexities, because there are sometimes no exact equivalents. Therefore, the translated questionnaires used to diagnose IBS and the questionnaires used to assess anxiety and depression levels would contribute towards heterogeneity in this meta-analysis. The newly revised Rome IV highlights this importance of cross-cultural competence in clinical medicine and research.68 The English version of diagnostic questionnaire for IBS in the Rome IV criteria has been translated into other languages and is being validated; this should make it possible to carry out cross-cultural and global epidemiologic studies.69 However, Rome IV criteria were not used in enrolled studies. 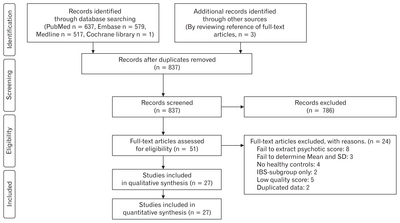 Several types of diagnostic criteria for IBS were used in studies selected in this meta-analysis, but the types of IBS criteria did not significantly influence heterogeneity. There are also cultural differences in the prevalence and diagnosis of anxiety and depression in different regions. Low prevalence rates of common mental disorders such as anxiety and depression in East Asia have been reported in a recent meta-analysis.70 In this meta-analysis, studies conducted in East Asia also showed lower pooled SMD in both depression and anxiety levels. The results of the WHO World Health Survey depression study also showed East Asia to have the lowest prevalence estimates.71 Reasons for the low prevalence of depression and anxiety in East Asia are still unknown, but both protective cultural factors and underestimation due to cultural differences could be possible explanations.70 Therefore, it is important to understand culture-specific ways to express mental symptoms.72 Consensus or guidelines must be proposed for the estimation of depression and anxiety levels in IBS patients from different cultural backgrounds, so cultural heterogeneity can be overcome. In general, higher prevalence among women was not limited to IBS, but pertained to anxiety and depression as well.73 Therefore, women were considered to have more impaired quality of life with IBS, due to the correlation between somatic symptoms and a gender-related increase in anxiety and depression prevalence.73 To know the gender effect on psychological factors among IBS patients, we tried to get the gender specific score of anxiety and depression. 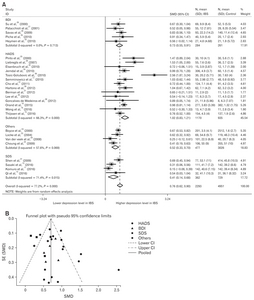 However, it is not possible to get the gender specific data in this meta-analysis. As an alternative, we studied the heterogeneity of the results according to the proportion of female patients. Interestingly, the proportion of female patients did not affect heterogeneity in this meta-analysis. In the meta-analysis, most studies, except 3,12,25,35 enrolled more than 49% of female patients; so, the proportion of female patients did not differ across studies. However, this finding means only that the proportion of female patients did not affect pooled SMD among the studies. The gender effect on psychological factors in IBS patients is still unknown because the data of either depression or anxiety levels between male and female patients in enrolled studies could not be acquired. A direct comparison between male and female patients was not possible in this study. The gender effect in IBS with psychological distress should be evaluated in prospective studies. In the meta-analysis on IBS-subtype, both depression and anxiety levels were higher in all IBS-subtypes. In our study, IBS-C patients showed the highest SMD for depression (SMD = 0.83; 95% CI, 0.61–1.06) and anxiety (SMD = 0.81; 95% CI, 0.59–1.04). One possible explanation for this finding is a change in the intestinal serotonin (5-hydroxytryptamine, 5-HT) system. Excess 5-HT could contribute to diarrhea through the 5-HT receptor; moreover, increased postprandial release of 5-HT in patients with IBS-D has been reported.74 On the other hand, the IBS-C subtype may be considered an imbalance of 5-HT secretion, and high levels of depression and anxiety in IBS-C subtype may be associated with low responsiveness of 5-HT in both the central and peripheral regions.75 However, all subtypes showed significantly higher depression and anxiety levels in our meta-analysis. This review has some limitations. First, we included English-language studies only; so some articles may have been missed despite extensive database searches. Second, high heterogeneity may be attributable to the assessment methods and regions under study in the primary studies. This makes it difficult to draw consistent conclusions about anxiety and depression levels among IBS patients. There is a need for consensus about the evaluation methods of depression and anxiety in IBS patients. In conclusion, the present meta-analysis showed that depression and anxiety levels were higher in IBS patients than in healthy controls, regardless of IBS-subtype. However, the gender effect on psychological factors among IBS patients could not be determined. Further prospective studies are needed to evaluate and compare the mechanisms of those relationships. The Seoul National University Hospital Medical Research Collaborating Center (SNUH MRCC) contributed to the review of statistical analysis. Fig. 1. PRISMA flow diagram of the meta-analysis. IBS, irritable bowel syndrome. Fig. 2. Forest plot and funnel plot of depression levels in irritable bowel syndrome (IBS) patients. (A) Forest plot of depression levels in IBS patients, divided by the type of questionnaire assessing depression levels. (B) Funnel plot of depression levels in IBS patients, divided by the type of questionnaire assessing depression levels. SMD, standard mean difference; BDI, Beck Depression Inventory; HADS, Hospitalization Anxiety and Depression Scale; SDS, Self-Rating Depression Scale; Others included sphere and Symptom Checklist-90; SE, standard error. Fig. 3. 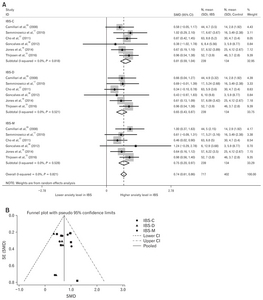 Forest plot and funnel plot of anxiety levels in irritable bowel syndrome (IBS) patients. (A) Forest plot of anxiety level in IBS patients, divided by the type of questionnaire assessing anxiety levels. (B) Funnel plot of anxiety levels in IBS patients, divided by the type of questionnaire assessing anxiety levels. SMD, standard mean difference; STAI, State and Trait Anxiety Inventory; HADS, Hospitalization Anxiety and Depression Scale; SAS, Self-Rating Anxiety Scale; Others included sphere, Symptom Checklist-90 and BAI; SE, standard error. Fig. 4. Forest plot and funnel plot of depression levels in subtypes of irritable bowel syndrome (IBS). (A) Forest plot of depression levels in IBS-subtype patients (B) Funnel plot of depression levels in IBS-subtype patients. SMD, standard mean difference; IBS-C, IBS with predominant constipation; IBS-D, IBS with predominant diarrhea; IBS-M, IBS with mixed bowel habits; SE, standard error. Fig. 5. Forest plot and funnel plot of depression levels in subtypes of irritable bowel syndrome (IBS). (A) Forest plot of anxiety levels in IBS-subtype patients. (B) Funnel plot of anxiety levels in IBS-subtype patients. SMD, standard mean difference; IBS-C, IBS with predominant constipation; IBS-D, IBS with predominant diarrhea; IBS-M, IBS with mixed bowel habits; SE, standard error. IBS, irritable bowel syndrome; BAI, Beck Anxiety Inventory; BDI, Beck Depression Inventory; HADS, Hospitalization Anxiety and Depression Scale; SAS, Self-Rating Anxiety Scale; SCL-90, Symptom Checklist-90; SDS, Self-Rating Depression Scale; STAI, State and Trait Anxiety Inventory. Two studies in Australia, 1 in Brazil, 1 in India, and 1 in Malaysia. Three studies using the Bowel Disease Questionnaire, 2 studies using Manning’s criteria and 1 study using Rome I criteria. SMD, standard mean difference; IBS, irritable bowel syndrome; BDI, Beck Depression Inventory; HADS, Hospitalization Anxiety and Depression Scale; SAS, Self-Rating Anxiety Scale; SDS, Self-Rating Depression Scale; STAI, State and Trait Anxiety Inventory. Drossman, DA (2016). Functional gastrointestinal disorders: history, pathophysiology, clinical features and Rome IV. Gastroenterology. 150, Array-1279. Lovell, RM, and Ford, AC (2012). 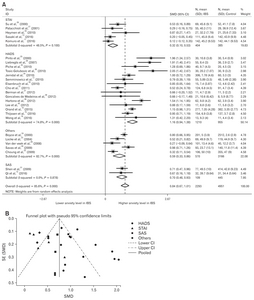 Global prevalence of and risk factors for irritable bowel syndrome: a meta-analysis. Clin Gastroenterol Hepatol. 10, Array-721. Mearin, F, Mearin, F, and Chang, L (2016). Bowel disorders. Gastroenterology. 150, Array-1407. Van Oudenhove, L, Crowell, MD, and Drossman, DA (2016). Biopsychosocial aspects of functional gastrointestinal disorders: how central and environmental processes contribute to the development and expression of functional gastrointestinal disorders. Gastroenterology. 150, Array-1367. Lee, SP, Sung, IK, Kim, JH, Lee, SY, Park, HS, and Shim, CS (2015). The effect of emotional stress and depression on the prevalence of digestive diseases. J Neurogastroenterol Motil. 21, 273-282. Houghton, LA, Calvert, EL, Jackson, NA, Cooper, P, and Whorwell, PJ (2002). Visceral sensation and emotion: a study using hypnosis. Gut. 51, 701-704. Wilder-Smith, CH (2011). The balancing act: endogenous modulation of pain in functional gastrointestinal disorders. Gut. 60, 1589-1599. Bennett, EJ, Tennant, CC, Piesse, C, Badcock, CA, and Kellow, JE (1998). Level of chronic life stress predicts clinical outcome in irritable bowel syndrome. Gut. 43, 256-261. Coss-Adame, E, and Rao, SS (2014). Brain and gut interactions in irritable bowel syndrome: new paradigms and new understandings. Curr Gastroenterol Rep. 16, 379. Orand, A, Gupta, A, and Shih, W (2015). Catecholaminergic gene polymorphisms are associated with GI symptoms and morphological brain changes in irritable bowel syndrome. PLoS One. 10, e0135910. Komuro, H, Sato, N, and Sasaki, A (2016). Corticotropin-releasing hormone receptor 2 gene variants in irritable bowel syndrome. PLoS One. 11, e0147817. Qi, R, Liu, C, and Ke, J (2016). Abnormal amygdala resting-state functional connectivity in irritable bowel syndrome. AJNR Am J Neuroradiol. 37, 1139-1145. Sasaki, A, Sato, N, and Suzuki, N (2016). Associations between single-nucleotide polymorphisms in corticotropin-releasing hormone-related genes and irritable bowel syndrome. PLoS One. 11, e0149322. Schneck, AS, Anty, R, and Tran, A (2016). Increased prevalence of irritable bowel syndrome in a cohort of french morbidly obese patients candidate for bariatric surgery. Obes Surg. 26, 1525-1530. Thijssen, AY, Mujagic, Z, and Jonkers, DM (2016). Alterations in serotonin metabolism in the irritable bowel syndrome. Aliment Pharmacol Ther. 43, 272-282. Wong, RK, Van Oudenhove, L, Li, X, Cao, Y, Ho, KY, and Wilder-Smith, CH (2016). Visceral pain perception in patients with irritable bowel syndrome and healthy volunteers is affected by the MRI scanner environment. United European Gastroenterol J. 4, 132-141. Seminowicz, DA, Labus, JS, and Bueller, JA (2010). Regional gray matter density changes in brains of patients with irritable bowel syndrome. Gastroenterology. 139, Array-57. Jones, MP, Chey, WD, and Singh, S (2014). A biomarker panel and psychological morbidity differentiates the irritable bowel syndrome from health and provides novel pathophysiological leads. Aliment Pharmacol Ther. 39, 426-437. Fond, G, Loundou, A, and Hamdani, N (2014). Anxiety and depression comorbidities in irritable bowel syndrome (IBS): a systematic review and meta-analysis. Eur Arch Psychiatry Clin Neurosci. 264, 651-660. Wells, G, Shea, B, O’Connell, D, and Peterson, J (). The Newcastle-Ottawa Scale (NOS) for assessing the quality if nonrandomized studies in meta-analyses. Berman, S, Suyenobu, B, and Naliboff, BD (2012). Evidence for alterations in central noradrenergic signaling in irritable bowel syndrome. Neuroimage. 63, 1854-1863. Choung, RS, Locke, GR, Zinsmeister, AR, Schleck, CD, and Talley, NJ (2009). Psychosocial distress and somatic symptoms in community subjects with irritable bowel syndrome: a psychological component is the rule. Am J Gastroenterol. 104, 1772-1779. Locke, GR, Weaver, AL, Melton, LJ, and Talley, NJ (2004). Psychosocial factors are linked to functional gastrointestinal disorders: a population based nested case-control study. Am J Gastroenterol. 99, 350-357. Boyce, PM, Koloski, NA, and Talley, NJ (2000). Irritable bowel syndrome according to varying diagnostic criteria: are the new Rome II criteria unnecessarily restrictive for research and practice?. Am J Gastroenterol. 95, 3176-3183. Pinto, C, Lele, MV, Joglekar, AS, Panwar, VS, and Dhavale, HS (2000). Stressful life-events, anxiety, depression and coping in patients of irritable bowel syndrome. J Assoc Physicians India. 48, 589-593. Su, YC, Wang, WM, and Wang, SY (2000). The association between Helicobacter pylori infection and functional dyspepsia in patients with irritable bowel syndrome. Am J Gastroenterol. 95, 1900-1905. Patacchioli, FR, Angelucci, L, Dellerba, G, Monnazzi, P, and Leri, O (2001). Actual stress, psychopathology and salivary cortisol levels in the irritable bowel syndrome (IBS). J Endocrinol Invest. 24, 173-177. Liebregts, T, Adam, B, and Bredack, C (2007). Immune activation in patients with irritable bowel syndrome. Gastroenterology. 132, 913-920.
van der Veek, PP, Van Rood, YR, and Masclee, AA (2008). Symptom severity but not psychopathology predicts visceral hypersensitivity in irritable bowel syndrome. Clin Gastroenterol Hepatol. 6, 321-328. Savas, LS, White, DL, and Wieman, M (2009). Irritable bowel syndrome and dyspepsia among women veterans: prevalence and association with psychological distress. Aliment Pharmacol Ther. 29, 115-125. Shen, L, Kong, H, and Hou, X (2009). Prevalence of irritable bowel syndrome and its relationship with psychological stress status in Chinese university students. J Gastroenterol Hepatol. 24, 1885-1890. Elsenbruch, S, Rosenberger, C, Enck, P, Forsting, M, Schedlowski, M, and Gizewski, ER (2010). Affective disturbances modulate the neural processing of visceral pain stimuli in irritable bowel syndrome: an fMRI study. Gut. 59, 489-495. Heymen, S, Maixner, W, Whitehead, WE, Klatzkin, RR, Mechlin, B, and Light, KC (2010). Central processing of noxious somatic stimuli in patients with irritable bowel syndrome compared with healthy controls. Clin J Pain. 26, 104-109. Jerndal, P, Ringström, G, and Agerforz, P (2010). Gastrointestinal-specific anxiety: an important factor for severity of GI symptoms and quality of life in IBS. Neurogastroenterol Motil. 22, 646-e179. Piche, T, Ducrotté, P, and Sabate, JM (2010). Impact of functional bowel symptoms on quality of life and fatigue in quiescent Crohn disease and irritable bowel syndrome. Neurogastroenterol Motil. 22, 626-e174. Tosic-Golubovic, S, Miljkovic, S, Nagorni, A, Lazarevic, D, and Nikolic, G (2010). Irritable bowel syndrome, anxiety, depression and personality characteristics. Psychiatr Danub. 22, 418-424. Cho, HS, Park, JM, and Lim, CH (2011). Anxiety, depression and quality of life in patients with irritable bowel syndrome. Gut Liver. 5, 29-36. Goncalves de Medeiros, MT, de Oliveira, RB, and dos Santos, AA (2012). The effects of sildenafil on rectal sensitivity and tone in patients with the irritable bowel syndrome. Aliment Pharmacol Ther. 35, 577-586. Hartono, JL, Mahadeva, S, and Goh, KL (2012). Anxiety and depression in various functional gastrointestinal disorders: do differences exist?. J Dig Dis. 13, 252-257. Lee, HF, Hsieh, JC, and Lu, CL (2012). Enhanced affect/cognition-related brain responses during visceral placebo analgesia in irritable bowel syndrome patients. Pain. 153, 1301-1310. Kabra, N, and Nadkarni, A (2013). Prevalence of depression and anxiety in irritable bowel syndrome: a clinic based study from India. Indian J Psychiatry. 55, 77-80. Park, JH, Rhee, PL, and Kim, HS (2006). Mucosal mast cell counts correlate with visceral hypersensitivity in patients with diarrhea predominant irritable bowel syndrome. J Gastroenterol Hepatol. 21, 71-78. Uz, E, Türkay, C, Aytac, S, and Bavbek, N (2007). Risk factors for irritable bowel syndrome in Turkish population: role of food allergy. J Clin Gastroenterol. 41, 380-383. Kohen, R, Tracy, JH, Haugen, E, Cain, KC, Jarrett, ME, and Heitkemper, MM (2016). Rare variants of the serotonin transporter are associated with psychiatric comorbidity in irritable bowel syndrome. Biol Res Nurs. 18, 394-400. Pinto-Sanchez, MI, Ford, AC, and Avila, CA (2015). Anxiety and depression increase in a stepwise manner in parallel with multiple FGIDs and symptom severity and frequency. Am J Gastroenterol. 110, 1038-1048. Mujagic, Z, Ludidi, S, and Keszthelyi, D (2014). Small intestinal permeability is increased in diarrhoea predominant IBS, while alterations in gastroduodenal permeability in all IBS subtypes are largely attributable to confounders. Aliment Pharmacol Ther. 40, 288-297. Sugaya, N, Nomura, S, and Shimada, H (2012). Relationship between cognitive factors and anxiety in individuals with irritable bowel syndrome. Int J Behav Med. 19, 308-315. Hod, K, Ringel-Kulka, T, Martin, CF, Maharshak, N, and Ringel, Y (2016). High-sensitive C-reactive protein as a marker for inflammation in irritable bowel syndrome. J Clin Gastroenterol. 50, 227-232. Eriksson, EM, Andrén, KI, Eriksson, HT, and Kurlberg, GK (2008). Irritable bowel syndrome subtypes differ in body awareness, psychological symptoms and biochemical stress markers. World J Gastroenterol. 14, 4889-4896. Keszthelyi, D, Troost, FJ, Jonkers, DM, Kruimel, JW, Leue, C, and Masclee, AA (2013). Decreased levels of kynurenic acid in the intestinal mucosa of IBS patients: relation to serotonin and psychological state. J Psychosom Res. 74, 501-504. Grasberger, H, Chang, L, and Shih, W (2013). Identification of a functional TPH1 polymorphism associated with irritable bowel syndrome bowel habit subtypes. Am J Gastroenterol. 108, 1766-1774. Bouchoucha, M, Hejnar, M, Devroede, G, Boubaya, M, Bon, C, and Benamouzig, R (2014). Patients with irritable bowel syndrome and constipation are more depressed than patients with functional constipation. Dig Liver Dis. 46, 213-218. Kanuri, N, Cassell, B, and Bruce, SE (2016). The impact of abuse and mood on bowel symptoms and health-related quality of life in irritable bowel syndrome (IBS). Neurogastroenterol Motil. 28, 1508-1517. Padhy, SK, Mishra, S, Sarkar, S, Bang, LG, and Panigrahi, M (2016). Comparison of psychiatric morbidity in patients with irritable bowel syndrome and non-ulcer dyspepsia. Ind Psychiatry J. 25, 29-34. Roohafza, H, Bidaki, EZ, Hasanzadeh-Keshteli, A, Daghaghzade, H, Afshar, H, and Adibi, P (2016). Anxiety, depression and distress among irritable bowel syndrome and their subtypes: an epidemiological population based study. Adv Biomed Res. 5, 183. Gao, J (2013). Correlation between anxiety-depression status and cytokines in diarrhea-predominant irritable bowel syndrome. Exp Ther Med. 6, 93-96. Dunlop, SP, Jenkins, D, and Spiller, RC (2003). Distinctive clinical, psychological, and histological features of postinfective irritable bowel syndrome. Am J Gastroenterol. 98, 1578-1583. Motzer, SA, Hertig, V, Jarrett, M, and Heitkemper, MM (2003). 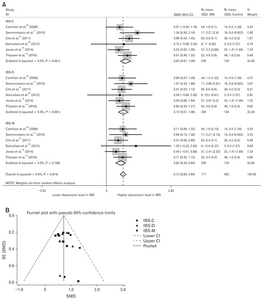 Sense of coherence and quality of life in women with and without irritable bowel syndrome. Nurs Res. 52, 329-337. Lee, KJ, Kim, YB, Kim, JH, Kwon, HC, Kim, DK, and Cho, SW (2008). The alteration of enterochromaffin cell, mast cell, and lamina propria T lymphocyte numbers in irritable bowel syndrome and its relationship with psychological factors. J Gastroenterol Hepatol. 23, 1689-1694. Hamaguchi, T, Fukudo, S, and Kanazawa, M (2008). Changes in salivary physiological stress markers induced by muscle stretching in patients with irritable bowel syndrome. Biopsychosoc Med. 2, 20. Akkuş, S, Senol, A, Ayvacioglu, NB, Tunc, E, Eren, I, and Isler, M (2004). Is female predominance in irritable bowel syndrome related to fibromyalgia?. Rheumatol Int. 24, 106-109. Dancey, CP, Attree, EA, Stuart, G, Wilson, C, and Sonnet, A (2009). Words fail me: the verbal IQ deficit in inflammatory bowel disease and irritable bowel syndrome. Inflamm Bowel Dis. 15, 852-857. Sato, N, Suzuki, N, and Sasaki, A (2012). Corticotropin-releasing hormone receptor 1 gene variants in irritable bowel syndrome. PLoS One. 7, e42450. Qi, R, Liu, C, and Ke, J (2016). Intrinsic brain abnormalities in irritable bowel syndrome and effect of anxiety and depression. Brain Imaging Behav. 10, 1127-1134. Camilleri, M, McKinzie, S, and Busciglio, I (2008). Prospective study of motor, sensory, psychologic, and autonomic functions in patients with irritable bowel syndrome. Clin Gastroenterol Hepatol. 6, 772-781. Lewis-Fernández, R, Hinton, DE, and Laria, AJ (2010). Culture and the anxiety disorder: recommendations for DSM-V. Depress Anxiety. 27, 212-229. Fang, X, Francisconi, CF, and Fukudo, S (2016). Multicultural aspects in functional gastrointestinal disorders (FGIDs). Gastroenterology. 150, 1344-1354.e2. Palsson, OS, Whitehead, WE, and van Tilburg, MAL (2016). Development and validation of the Rome IV diagnostic questionnaire for adults. Gastroenterology. 150, 1481-1491. Steel, Z, Marnane, C, and Iranpour, C (2014). The global prevalence of common mental disorders: a systematic review and meta-analysis 1980–2013. Int J Epidemiol. 3, 476-493. Rai, D, Zitko, P, Jones, K, Lynch, J, and Araya, R (2013). Country- and individual-level socioeconomic determinants of depression: multilevel cross-national comparison. Br J Psychiatry. 202, 195-203. Steel, Z, Silove, D, and Giao, NM (2009). International and indigenous diagnoses of mental disorder among Vietnamese living in Vietnam and Australia. Br J Psychiatry. 194, 326-333. Houghton, LA, Heitkemper, M, and Crowell, M (2016). Age, gender and women’s health and the patient. Gastroenterology. 150, Array-1343. Spiller, R (2008). Serotonin and GI clinical disorders. Neuropharmacology. 55, 1072-1080. Muscatello, MR, Bruno, A, and Pandolfo, G (2010). Depression, anxiety and anger in subtypes of irritable bowel syndrome patients. J Clin Psychol Med Settings. 17, 64-70.